Fortech joined Beard Brothers 1.12 Wheels for Life community initiative, aiming to buy an ambulance for the local emergency medical system in Cluj country. The company offered a sponsorship of 15.000 euro and during the summer started an internal fundraising campaign, encouraging the team to add up their own contribution. The amount raised from individual participation reached 5000 EUR. Fortech supports the unconventional Beard Brothers in their initiative for buying an ambulance for the emergency medicine system (SMURD). While for Beard Brothers, this is the most challenging fundraising campaign, for Fortech this represents the first major collective community involvement initiative. The internal campaign started the summer of 2018 and was active in all operational centers from Cluj, Iasi, and Oradea. The teams donated a third of the sum already entrusted by the company. “December has a special significance for us. It is the month when Fortech celebrates 15 years of existence, 15 years of growth and evolvement alongside the community. We wanted to make this a moment to remember by supporting a cause that brings a major impact in the community. We teamed up with Beard Brothers in a half-a-year long campaign because we appreciate SMURD’s work and their commitment to saving lives. Working for the IT industry is a privilege, and we realize that only by supporting visionary NGOs we can influence our present and future. It’s the second year when we partnership with SMURD Cluj. 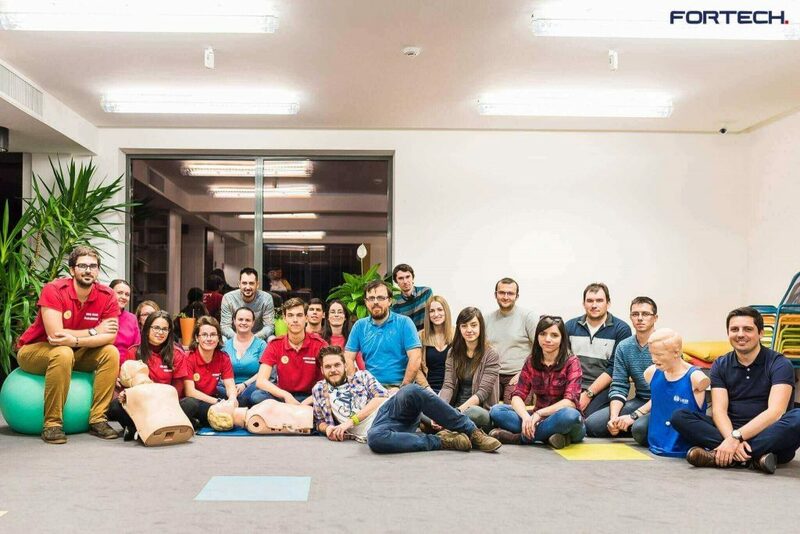 This year we organized first-aid training sessions for our employees and collaborators, and in the last two years, we supported the Emergency Medicine Summer School. These are part of our CSR actions, Fortech contributes to a series of other initiatives, especially from the social sector.” (Călin Văduva, CEO Fortech). The 1.12 Wheels for Life Campaigns managed to bring together donors from Romania and from outside the borders of the country. Thousands of donors reached their hands for buying a brand-new ambulance for SMURD. In Cluj county, all ten ambulances in service are older than six years, while in the rest of the European countries the lifetime of an emergency intervention vehicle is five years. Supporting Beard Brothers’s campaign is one of Fortech CSR actions. The company sustains a lot of other initiatives such as educational programs, creative industries projects and social causes. In 2018 Fortech supported the 4th edition of Discover Your Call in IT, a reference program for the company. Over 130 high school students from Cluj, Bihor, Sibiu, and Mures were enrolled on this year’s edition. The youngsters developed software applications under the guidance of Fortech mentors and from other IT companies. Furthermore, Fortech strengthened its partnerships with UBB Cluj-Napoca and Cluj Technical University. Starting with this autumn students from the last year of study will be mentored and trained by Fortech. Organized in teams, they will design and write code for software apps. The initiative is one of the few good practices when the business sector collaborates with the academic environment in helping graduates to overcome the job market challenges. This year, Fortech sustained the International Mathematical Olympiad, a well-known international competition dedicated to high school students passionate about science. Over 600 students from 114 competed for the Olympic title at Cluj-Napoca. In Iasi and Oradea, the company continued its partnerships with local universities and student organizations. The company developed internship and pre-employment programs. After 4-12 weeks of training, the students could apply for a job at Fortech. Since 2016, 85% of the students enrolled in the programs were hired only in Oradea. Fortech continued the partnership with Electric Castle, developing the app for one of the most appreciated music festivals in East-Central Europe. These were a few of the community initiatives supported by the company. For 2019 Fortech plans to develop further more the existent partnerships and reinforce the four pillars of its CSR strategy: education, health, creative industries, and social causes.